Airport Van ( Parisgreencar ) is a french registered company ( SIRET 44069650800033 ) thats use the commercial name Parishuttle.The registered address is – 103 rue villiers de l'isle adam 75020 Paris France. 1 - What information do we collect and how do we use it? In order to book and arrange your transfer we need these details to perform our contract with you, and in case we need to get in contact with you regarding your order. We must send you a confirmation email as part of our contract with you. We may need to send you updates about your transfer, to connect you with your driver and help with your trip, particularly in the unlikely event of changes to any part of your journey. We need these so we can track your arrival or departure times and ensure your transfer is as smooth and timely as possible. We need to know where to drop you off and pick you up. We take payments securely online,.Your card details are entered in a highly secure part of the payment page so Airport Van ( Parisgreencar ) never sees or stores your details. Your billing address is requested solely to help with fraud detection and protect your card details. Airport Van ( Parisgreencar ) never shares your payment details with anyone. We collate - but do not store - your payment information solely for the purpose of making your booking. If you have booked via a Airport Van ( Parisgreencar ) affiliate site, then the affiliate has the right to request and receive your booking data, but not your payment data. For the purposes of the Data Protection Act 1998, and the General Data Protection Regulation (GDPR) 2016 which superseded it in May 2018, we are a data controller. In order to process your booking we need to collect certain personal details from you. We will require only the personally identifiable information necessary to ensure the successful fulfilment of your travel arrangements. We have appropriate security measures in place to protect the personal details you give us. We will not pass any information on to any company and/or organisation not responsible for providing any part of your travel arrangements. We are entitled to assume you do not object to our doing any of the things mentioned above unless you tell us otherwise in writing. You are generally entitled to ask us (by letter or email) what details of yours are being held or processed, for what purpose and to whom they may be or have been disclosed. We will charge a fee to respond to such a request. 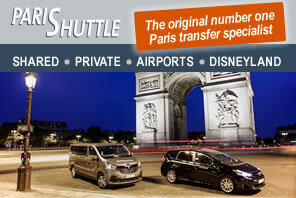 Please email us at reservation@parishuttle.com. Except where expressly permitted by the General Data Protection Regulation, we will only deal with the personal details you give us as set out above unless you agree otherwise. If you're aged under 18, you cannot make any bookings on our website - a parent, guardian or appropriate adult must book on your behalf. Cookies are small pieces of information that are stored by your browser on your computer's hard drive. Our cookies do not contain any personally identifying information. Cookies can be deleted from your hard drive if you wish. Most web browsers automatically accept cookies, but you can usually change your browser settings to prevent that. Even without a cookie you can still use most of the features on the website. We only store the minimum possible amount of personal information, which is required to process your booking . This policy is dated 25th May 2018. We may change and improve this from time to time, at which point we will update the policy with the appropriate date.